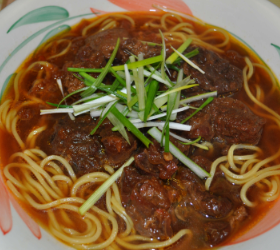 Much as beef stew is the comfort food of Americans and Europeans, beef stew noodle soup is the comfort food of the Taiwanese. 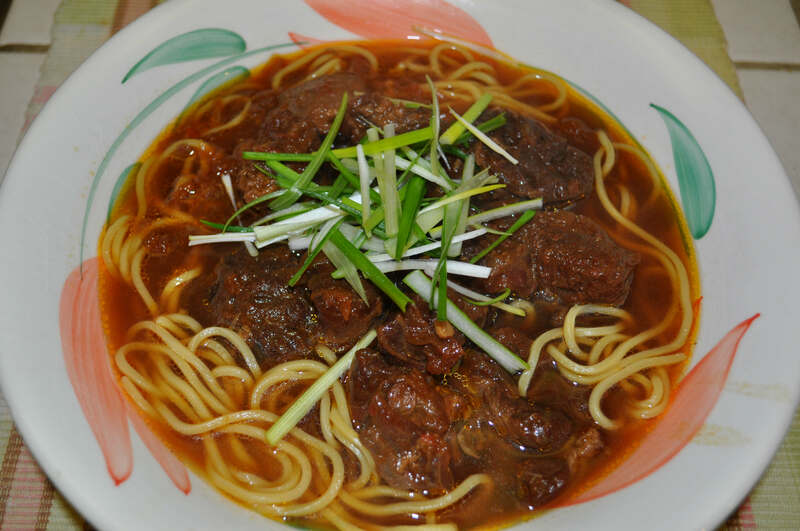 Though variations on the dish may be found throughout China, Taiwan’s take on beef noodle soup is unique: beef is braised slowly for hours and cooked in chili bean paste sauce. 12/7/2012 – We’ve recently updated this recipe, originally published Jan. 3, 2011, to answer some questions from reader Emie Lee. Thanks Emie for following the blog and sending in your questions! 3-4 lbs of beef shank. In Chinese supermarkets, they sell beef shanks in whole pieces. This recipe calls for 2 medium-sized pieces. Place 2 whole pieces of beef shank into the hot water, then cook for 3 minutes. Remove beef from the pot, rinse the pieces in water, and then cut the beef into large chunks. Heat oil in a wok, adding ginger and garlic first, then stir frying for about 2 minutes. Then add onion to the wok along with bean sauce, and stir fry for another 3 minutes. Continue to stir fry, adding tomato and beef chunks until the meat turns white. Then add soy sauce, cooking wine and star anise. Either use the same wok or transfer to a larger pot with accompanying lid. Add water to cover the meat and cook for about 4 to 5 hours over the low heat until beef is tender. The liquid in the beef stew will be condensed when it is done. Cook noodles as indicated on the package instructions. Add beef stew soup into the noodle, as well as either hot water or soup stock to taste. Garnish the beef noodle soup with fresh cilantro or green onion and serve. *If you prefer strong flavoring when it comes to beef noodle soup, increase the quantity of chili bean sauce in the recipe. 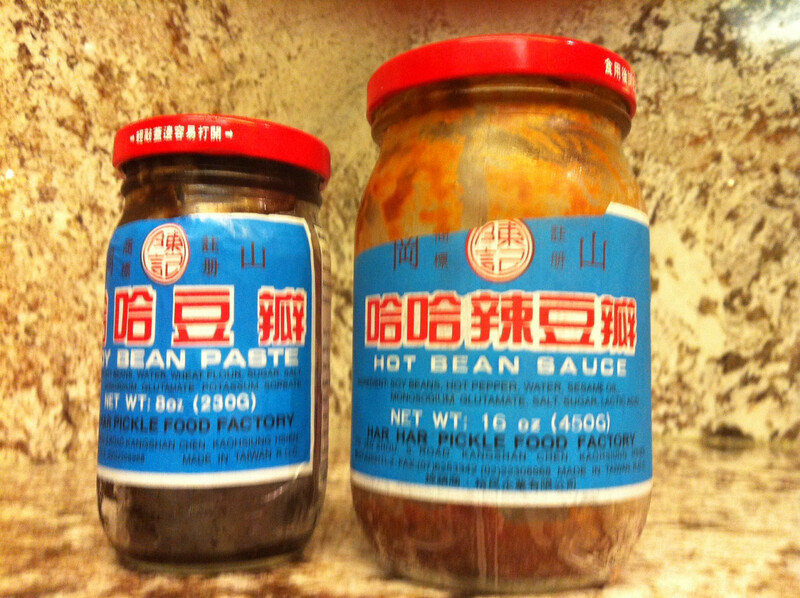 What kind of chili bean sauce or bean sauce do you recommend? A picture of the packaging would help a lot. When cooking the meat for 4-5 hours, do you use a slow cooker or just a normal pot? If it’s a slow cooker, what brand or kind would you recommend? Use a regular pot to stew the meat. A slow cooker will be fine too, but a slow cooker will retain the liquid. By contrast, a regular pot will allow the soup to condense, which enhances the flavor of meat.